The 991LB linkage round bale wrapper is a manual machine where four individual levers control all wrapping functions. This 991LB round bale wrapper can be powered either from a tractor or an independent power pack. On the 991LB round bale wrapper the control valve can either be mounted beside the dispenser post or just outside the tractor cab. The RDS control unit measures the revolutions per minute and monitors the number of layers as they are being applied to the bale, a beep sounds on the second last rotation, this gives the operator sufficient time to slow down the wrapping table. The wrapping table on the 991LB linkage round bale wrapper is constructed of four heavy-duty belts, which ensure smooth and even bale rotation even when dealing with loose or asymmetric round bales. 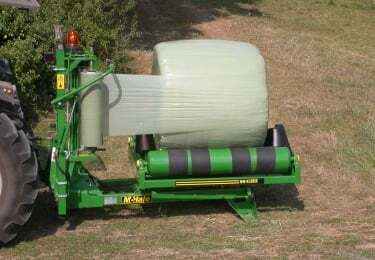 The 991L linkage round bale wrapper is fitted with a 750mm aluminium dispenser, which is standard on all McHale round bale wrappers and maintains a consistent stretch, which maximises film usage. The unit consists of two aluminium rollers, which are geared to each other with robust steel gears of different ratios. The dispenser unit on the 991L linkage round bale wrapper is designed so that the angle that they work at during the bale wrapping cycles stays constant. This gives a more even stretch through the roll of film. The dispenser unit also features a McHale quick fit system to make film changing much more user friendly. The dispenser lock and load system on the 991LB linkage round bale wrapper makes film loading really easy. When removing the core of the used roll the dispenser bobbin locks in place. When a new roll is loaded it can be locked in place by simply pulling the cord. The McHale hydraulically operated cut and hold system on the 991LB linkage round bale wrapper cuts and holds the film in position ready to wrap the next bale. This time saving device eliminates the need to manually reattach the film. Uniquely designed, this system works reliably and consistently in all weather conditions. The in-cab control unit on the 991L linkage round bale wrapper enables the operator to change the number of table rotations (layers) and select the desired number of film layers. The control unit also allows the operator to store bale totals from different jobs.